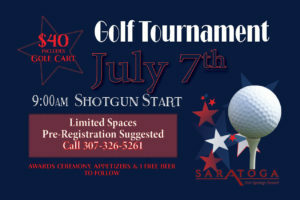 Get ready for our Golf Tournament on July 7th with a 9:00 a.m. shotgun start! There are limited spaces and pre-registration is suggested. The fee is $40 which includes a golf cart, awards ceremony, appetizers and a free beer to follow! You won’t want to miss out on this day of fun and friendly competition, call us at 307-326-5261 to pre-register for your spot on the course!